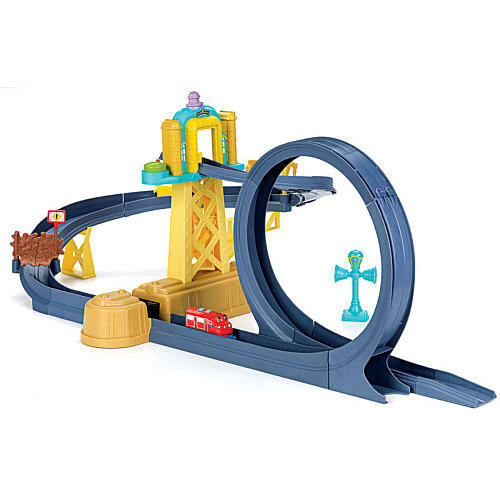 The Training Yard with Loop Playset is a truly action-packed experience! Engines plummet down the spiral track, shoot through the motorised launcher, and race around an exciting 360° overhead loop! The motorised engine launcher propels up to two engines through the loop. Includes a die-cast Wilson engine and a Vee figure. B is a HUGE train fan, so naturally he loves Chuggington! The upbeat show is a favorite in our home. Because he's very farmiliar with the show and the train character's he was thrilled to have a chance to check out the Chuggington Training Yard with Loop Playset by Learning Curve. The set only takes a few minutes to set up out of the box, and your ready for play! 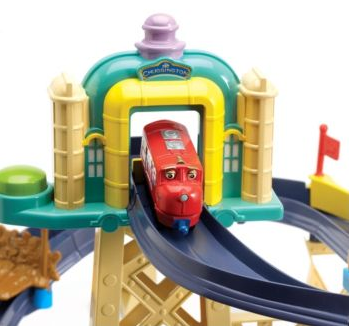 I was interested to see if the trains actually made it around the loop (we have owned other loop style playsets, however the cars would get half way around and fall). Because their is a "motorized launcher" the trains absolutely make it around the loop! You can even connect additional die cast trains and send them through the loop adventure together. B has had hours of fun with the Chuggington Training Yard with Loop Playset and looks forward to extending his collection with the additional compatible sets. The Chuggington Training Yard with Loop Playset would make an amazing gift for the young train enthusiast in your life this Holiday Season! Endless hours of fun for the young train enthusiast! 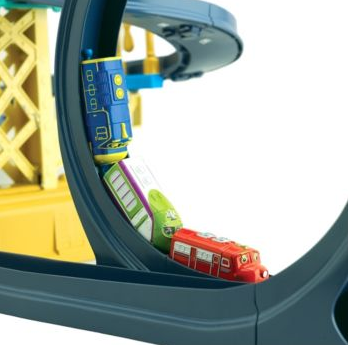 One Lucky Reader will receive the Chuggington Training Yard with Loop Playset by Learning Curve! Leave a comment~Visit http://www.learningcurve.com/ and let me know another item you'd love to gift or receive this Holiday Season. The comment is considered your entry. I'd love to gift the A Busy Day at the Quarry Set. Love the Thomas the Train wooden railway set. I'd love to give the daisy greenway interactive camper to my little girl! Love the John Deere tractor!